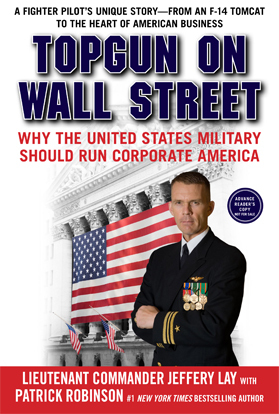 How would the United States Military run Corporate America? Written with Patrick Robinson, New York Times #1 best selling author of Lone Survivor, Jeff details his experiences as a Navy fighter pilot. He describes the aura of accountability every naval officer lives with, and how their lessons can help you achieve excellence. The book draws from the sacred laws of the United States Naval Academy, Naval Aviation, and the Navy Fighter Weapons School - TOPGUN. This no holds barred account demonstrates first hand how the United States Navy came to believe perfection is attainable, and transformed itself following a period of terrible loss. Jeff takes you deep into the private corridors of Annapolis, where this storied institution - and its hallowed alumni - impart a sense of honor and responsibility in its graduates. Its timeless traditions, and incredible lineage of heroic admirals, are brought forward in an appeal to maintain an enduring reverence for the past. The pinnacle of the story revolves around the lessons of TOPGUN. Jeff brings you into the cockpit of an F-14 Tomcat as he makes his first night carrier landing, and masters the art of air warfare flying thousands of miles per hour over the desert floor. Through it all, Jeff conveys the Navy's formula to unprecedented success. Translating this formula to business, Jeff describes his transition to Wall Street as a Wealth Advisor at Neuberger Berman, A Lehman Brothers Company. He exposes the warning signs present during the time period leading up to the greatest collapse in financial history, and how TOPGUN's lessons could have helped avoid it all. The book concludes with an exacting description of the Seven Critical Skills of High Performance Organizations - the very rules Naval Aviation used to overcome issues related to baselining during the 1990's. Jeff lays out each skill in easy to understand terms such that the reader can apply the concept in their business and corporation.